1. What is Stomach Ulcer? Stomach ulcers, also known as gastric ulcer or peptic ulcer, is a lesion that forms in the lining of the stomach. Doctors used to believe that stressful lifestyle and poor diet caused ulcers. Later, it was discovered that an off-balance between digestive fluids (hydrochloric acid and pepsin) resulted in ulcers. Today, research shows that most ulcers develop as a result of infection with a spiral-shaped bacterium found in the stomach called Helicobacter pylori (H. pylori). The bacteria can also attach to stomach cells, further weakening the stomach's defensive mechanisms. For reasons not completely understood, H. pylori can also stimulate the production of acid in the stomach and cause tissue damage and inflammation, which may finally result in an ulcer. Stomach ulcer causes burning sensations in the abdomen behind the breastbone which can be especially painful when the stomach is empty. Other symptoms include belching, nausea, fatigue, heartburn, vomiting, chest pain, bleeding, and loss of appetite and weight. 4. Any Suggestions for Relief? Antacids and antibiotics are used to treat such infection, but today the bacteria is growing increasingly in resistance to antibiotics. 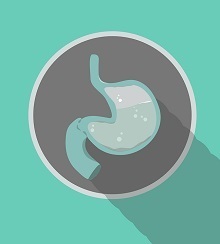 Alcohol, cigarettes, spicy foods, tea, and coffee are some gastric irritants that should be avoided as they can potentially aggravate ulcer conditions. Taking several small meals throughout the day instead of eating three large meals can be helpful as this translates to less acid production in the stomach at each meal. A high fibre, low carbohydrate diet, and vegetables such as cabbage and broccoli all promote ulcer healing. Also, drinking lots of water can ease ulcer problems. In seeking natural remedies, many people have testified that taking 1 Tablespoon of raw honey, especially Active Manuka Honey with 1/4 Teaspoon of cinnamon powder on a daily basis can effectively treat stomach upset and clear ulcers in the stomach from the root. End of "5 Facts about Stomach Ulcers (Home Remedy Included!)" Back to "Alternative Medicine: What Your Doctors Don't Know".